Are you looking for the best plan for you that meets your budget? We design personalized solutions. There is no one-size-fits-all strategy. No two people are alike and no two situations are alike. That's why we develop a custom solution that's perfect for you and your budget. We research the leading companies and products on the market. We only work with highly rated companies and better priced products for our clients' best interest and affordability. We also track the new healthcare laws, including Medicare laws, so you don't have to. We are members of the National Association of Insurance and Financial Advisors (NAIFA), an organization formed to provide assurance to clients that they are getting a qualified, experienced, competent and ethical appraiser with up-to-date education and knowledge of industry standards. We will help you assess your potential long term care needs to make sure you have affordable insurance in place to cover your expenses and protect your family and assets. We can make sense of it all for you. We have Medicare Advantage plans with prescription drugs (MAPD) starting at $0 per month. Yes, that's zero dollars! This is the only way to know exactly what your health care costs will be. These cover deductibles and coinsurance, depending upon the specific plan that's best for you. No prescription coverage is included. Prescription coverage is obtained through a stand-alone Medicare Part D. Don't worry! We'll help you determine which plan or plans you need. We'll discuss all possible contingencies so there are no surprises. Gap plans help cover hospital deductibles and co-pays. We have plans available from $35 - $100 per month, depending upon your age. Easy yes/no applications. No medical exams. No attending physician statements. No blood tests. We make it easy and affordable for you to have the protection you need. We love the new hybrid income producing annuities with long term care benefits. If you are looking for a lifetime income when you retire or a safe place that never goes down with the market that also protects your estate in case you need Long Term Care, and has a great rate with a bonus at the beginning, we have the perfect annuity for you. We will search out the best prices at the mostly highly rated companies to find a plan that fits your budget. Protect your family from an unexpected loss of your income. You'll be able to keep paying your bills, and your family will not be burdened by them. If you have an estate you want to leave to your heirs and do not want to burden your family when you need assistance with activities of daily living or skilled nursing in your later years, then we can design the right plan within your budget to meet your needs whether you want to stay in your own home or move to assisted living until a skilled nursing facility is required. We'll help you protect your assets from potential spend-down situations. These trusts are exempt from the Medicaid look-back period. We can set up an irrevocable funeral or estate trust (amount depending on state law) and help you get the information you need when planning for the use of Medicaid in your Long Term Care planning. These documents guarantee that your personal wishes are met. They also remove the burden from your family. This is not a burden you want your family to deal with at an emotional time. We can stay within your budget and lock in the price so it will never go up even if you live 20 more years. Again, we can help you address the hard-to-discuss questions and situations. Pre-planning is one of the best gifts you can give yourself and your loved ones. 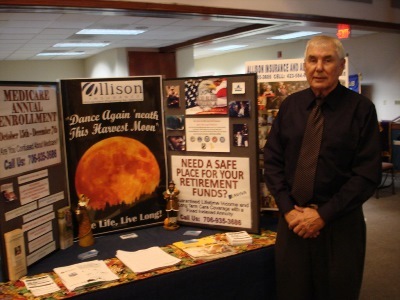 Allison Senior Advising serves Wilson Funeral Homes as Pre-need Advisors. Most of all, we want you and your loved ones to have peace of mind. With pre-planning done and insurance and lifetime income in place, you can relax knowing that your future needs are taken care of.